Reflective/photo luminescent pressure sensitive material providing the highest level of nighttime visibility. Available in over 25 titles, all numbers. Available in Yellow or White. Click on Helmet/Vehicle Stickers to see the full line of available stickers. 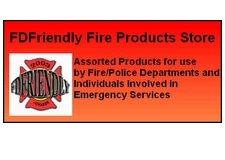 PA Fire Police logo decals - as shown on the image. Assorted sizes - see offering. Inches shown is the vertical measurement.